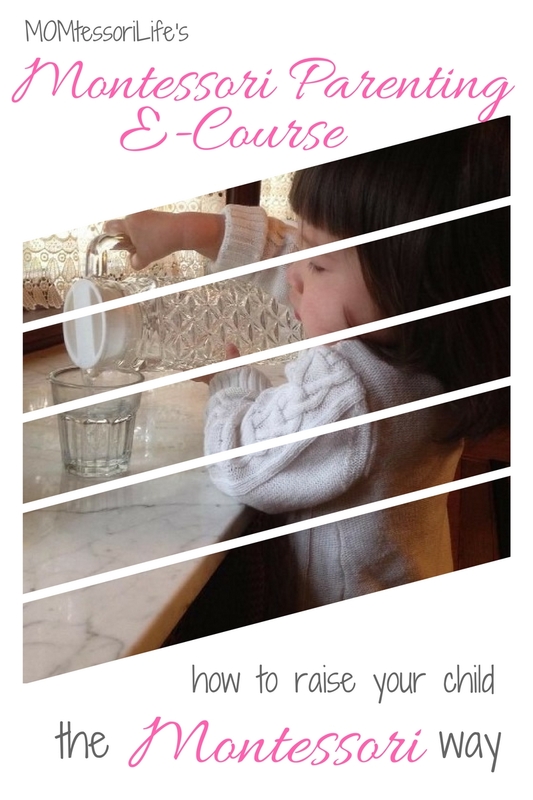 You’ve all been asking for it, and I’m proud to present my new Montessori Homeschool Preschool E-Course!!! This Montessori Homeschool Preschool E-Course combines my unique experience as both a Montessori classroom teacher AND a homeschooling parent to help other parents learn about Montessori philosophy and how to set up and run a Montessori Homeschool Preschool for their own children. This course will take you step-by-step through the entire process — from Montessori philosophy points to keep in mind, to setting up the learning environment, to lesson prep and the order in which to present them, to sample work trays in each section for ages 2, 3, and 4/5, to how to create your own unit studies and Montessori-materials [as well as where you can find them available for purchase], to creating your daily classroom rhythm, and all the way through to what to do when it all goes wrong! I’ve created this course to be applicable to families with a wide range of budgets and space available for homeschooling and with modifications that can be made when you have children of varying ages. In order to keep this Montessori Homeschool Preschool E-Course affordable for ALL families, I have not included detailed lesson instructions — but I do provide information on how to find free Montessori lesson instructions as well as where to purchase if you have room for that in your budget. This course is ideal for families with children between the ages of 1.5 and 5, although there are materials listed for children as old as 6. The Montessori Homeschool Preschool E-Course is composed of written instruction supplemented with videos and photographs. Videos included within the course contain information on how to complete and analyze an observation to help prepare your environment to meet the needs expressed by your child, the key principles found in Montessori materials and how to set them up on work trays, a sample Montessori homeschool preschool room layout, a time lapse of a work cycle in our homeschool preschool, and a demonstration of a three period lesson. This is a take-at-your-own pace course, which means you can begin whenever you’d like and finish in your own time. You will be able to go back and forth within the course contents and you will have lifetime access to everything in the course. Sign up now to get started on creating an ideal learning environment for your own child at home! 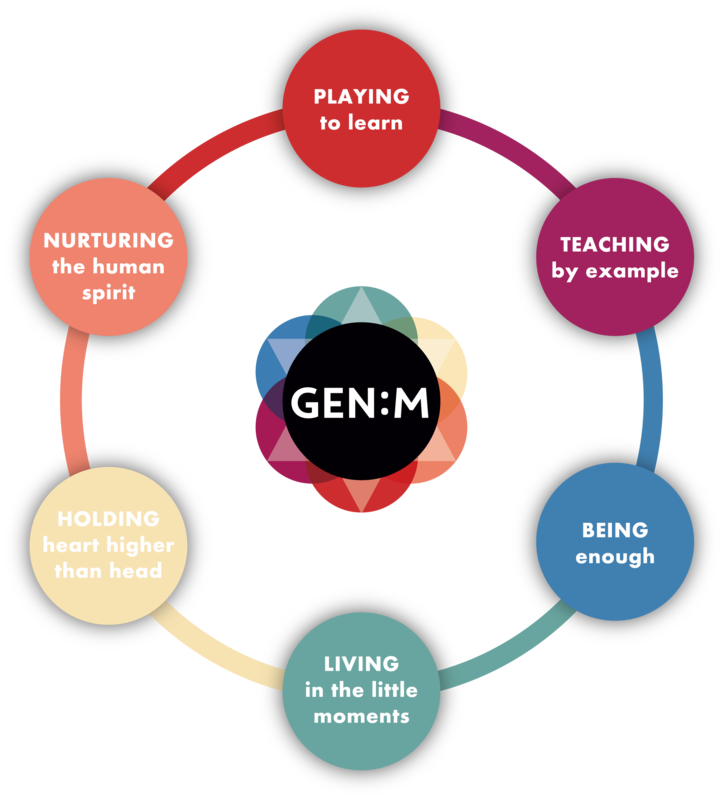 Love the blog, but want to know how you can apply these Montessori concepts to your everyday life? Intimidated by how independent my Montessori kids are, and wondering how you can ever get yours to do the same things? Searching for some way to go further with your children and help them find who they were meant to be? Look no further, friends. I’ve created a course for that! Come discover some simple tips for how to be Montessori at home in my Montessori Parenting E-Course! I’m so excited to share everything I’ve learned through my AMS training as well as trial and error as a Montessori parent! This is a take-at-your-own-pace course — start when you’re ready, finish when you have time, and go back to it as often as you like! And guess what, folks? This is Montessori. That means there are NO TESTS!!! Join us as we dive into the major concepts of Montessori education before taking a tour of your home to see what simple changes you can make to follow your child! We will also be getting into the dirty stuff — DISCIPLINE, and how to discipline your child in a way that makes sense and teaches lifelong lessons. Students will also gain access to a private, invitation-only Facebook group where you can share your progress and ask more specific questions about your own home environment! I will be popping in frequently to chat and be your own personal Montessori parenting consultant. This is NOT a homeschooling curriculum. This course teaches a Montessori lifestyle — every moment thereafter will be a natural “homeschooling” process in your child’s daily life. So join me in this adventure and enroll in my Montessori Parenting E-Course today! I am now offering a 1.5hr workshop to present at schools around the U.S. on how to bring Montessori into the home. Contact me if you would like more information! Photo courtesy of the Greater Pittsburgh Montessori Society. I also have personalized Montessori parenting consultation options available — these range from written consultations to video conference call consultations to in-home observations and consultations. “Our son just turned 3 and he’s so advanced with learning and is so keen to learn more every day. My hubby is a certified Montessori teacher and I worked at a Montessori campus in Germany for many years. We always knew we’d like to integrate it into our lives but weren’t always sure how. He’s learning and getting through these activities faster than I can keep up with him! It’s amazing. Thank you!” ~ Sarah B. “I met you at the [Bringing Montessori Into the Home] workshop (I had the two boys, ages 1 and 3…) – I’ve enjoyed implementing your ideas at home. The prepared environment has done wonders for our household!” ~ Jocelyn F.
“Thank you Angela for your inspiration on a DAILY basis! Seeing all the activities you do with your girls shows me I can do it! You really inspired me to kick off our homeschool reboot in a BIG way in December. I’m really looking forward to it!” ~ Melissa P.